Sharing stories of people doing both good and great things inspires others. When it comes to giving, people can often feel shame and inadequacy. However, the Bible reveals great nuggets from people who lived attainable generous lives on an every day basis. I was recently reading through the Gospel of Luke and was captured by these stories of generosity. 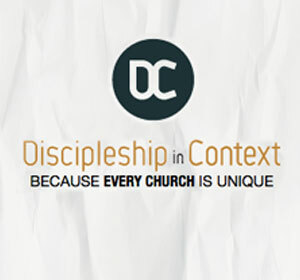 Jesus introduces us to men and women, both mature and immature in their faith. He describes both real and fictional characters engaged in very normal activities; still they manage to live abundantly generous lives. Some of these characters are expected while others are rather unexpected. 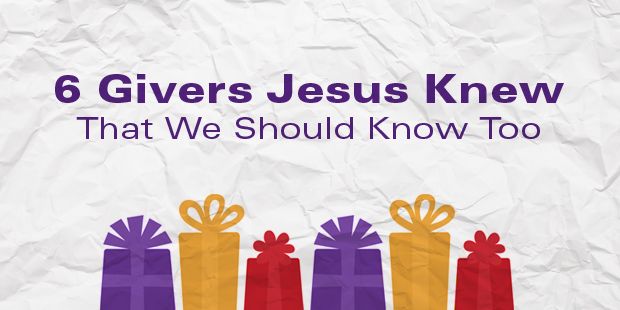 Here are some giving people that Jesus knew and wants us to know. Unsuspecting Giver– Luke 8:1-3 tells us about some of the early actions of the 12 disciples and several ladies. These early recruits were newbie’s in the faith, straight out of the marketplace. On top of that, the women are described as formerly having evil spirits, diseases, and demons. This is probably not the list that most would make heroes of or at least not just yet. Still these early adopters who are taking their first steps of faith are said to be supporting Jesus “out of their own means” and Jesus wants to make sure you know them. There are no high and lofty requirements to generosity, just give. Called Giver– Luke 9:3 and 10:4 introduces us to an extreme giving request of Jesus. He called His early disciples, over 80 of them, to give up everything for the sake of a short-term mission trip. He sent them all out into the harvest, to share the good news and help people with their needs. Jesus called them to go, take nothing, not a dime or a change of clothes, not even a snack. We are called to support Jesus both out of our means and at times by giving up all that we have. Don’t worry, you won’t be the first or last person Jesus asks or sends out – just one of many who have learned to enjoy the adventure. Compassionate Giver– Luke 10:35 introduces us to a fictional character, but the story is powerfully real. Today we call him The Good Samaritan, a man who allowed his day to be interrupted. He didn’t permit the inconvenience or expense to stop him. Whatever others may say about his investment in a troubled person did not matter. He gave compassionately and comprehensively. No trite pat on the back here. Rather he gave time, energy, and resources over an extended period for a man he may never see again. Giving people are both simple and alert. This story could look a little heroic, but it’s really just common courtesy. If you can’t be stopped in your tracks, you will never be able to give compassionately. Investing Giver– Luke 10:15ff is another fictional character in a very real situation. It’s a successful businessman tempted by greed. His thriving business has put him in a quandary. His barns are too small, so he builds bigger barns to store his wealth and coast into the future. Only life changes and his money can’t solve his spiritual problem. Focusing on an earthly investment did not pay off as he anticipated. Jesus instructions are to live by faith and don’t trust in worldly wealth. Instead, sell your possessions and give to the poor. This will reap an unstoppable reward and grow a heart toward God. Seeing the future clearly helps us hold loosely to the things of today. Fake Giver– Luke 18:22 shares about a man who lived on the dark side of generosity. We commonly call him the Rich Young Ruler. He appears to desire a relationship with Jesus; however, as the story unfolds we learn where his heart really is. He is so proud of his religious life, and then Jesus exposes that it is paper-thin. No hero here. This is only a stark reminder that the Rich Young Ruler can be a stealthy resident in the life of very religious people. He chooses to fail at generosity and he had all the resources to accomplish it. How sad. Transformed Giver– Luke 19:8 provides us with an immediate and rather bold response of faith. It comes from Zacchaeus. He is a brand new follower of Jesus – less than one day. He is really wealthy just like the Investing Giver and the Fake Giver. Jesus doesn’t ask him to show his faith through generosity at all. This still this doesn’t stop Zaccheus from thinking about it on his own. He confesses his financial sins having been a cheat and thief. Then he demonstrates a changed life by giving half of his possessions to the poor and paying back anyone he wronged four times what he owed them. Jesus said we would be known by things like love and fruit. Generosity is a great demonstration of both. These are just a few of the giving stories in the Bible. Why not pick one of the stories and share it with someone else? Why not make a commitment to learn and live the lessons of one of them this week? You might even consider reading one of the stories to your family and create a family practice of learning to live generously. 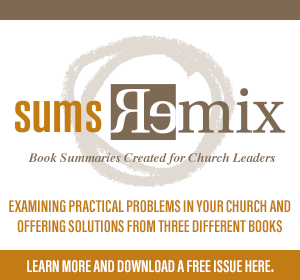 Would you like to learn more about generosity for your church? Connect with an Auxano Navigator and start a conversation with our team.